"Theater of the World" by Thomas Reinertsen Berg, translated by Alison McCullough. Thomas Reinertsen Berg is a Norwegian journalist and writer. He has written for Morgenbladet, Klassekampen, Dagsavisen, and other papers. "Theater of the World: The Maps that Made History," his first book, was honored with the 2017 Brageprisen, an award given annually to Norway's premier work of nonfiction, and begins with the historic "Earthrise" image taken from NASA's Apollo 8 mission around the moon. Berg contributed this article to Space.com's Expert Voices: Op-Ed & Insights. Thomas Reinertsen Berg, author of "Theater of the World." No wonder that the American space program that brought three men to the moon was named after that high-flying god. The program got its name from NASA manager Abe Silverstein early in 1960, who later said he felt Apollo riding his chariot "was appropriate to the grand scale of the proposed program." But he wasn't the first to consider Apollo an apt metaphor to view the world from above. "Ortelius, who the luminous Apollo allowed to speed through the high air beside him in his four-horse chariot, to behold from above all the countries and the depths that surround them." It was because of this remarkable perspective that Ortelius could draw so many and so accurate maps. The world map in Theatrum depicts an Earth in light brown, blue and red, dark yellow and green, with a dark blue, almost black space surrounding it. At 4 hours, 58 minutes and 35 seconds into their voyage, Lovell says: "I'm looking out my center window, which is a round window, and the window is bigger than the Earth is right now. I can clearly see the terminator. I can see most of South America, all the way up to Central America, Yucatan, and the peninsula of Florida. There is a big swirling motion just off the East Coast, and then going on over toward the east, I can still see West Africa, which has a few clouds right now. We can see all the way down to Cape Horn in South America." Looking back at the Earth, Anders can't help being fascinated by its beauty, and so takes three or four pictures every now and then, even though that's not strictly scheduled. There was zero interest in images of the Earth at the outset. "Nobody told me to take a picture of the Earth," Anders said later. NASA wanted pictures of the dark side of the moon. When they get there, Anders photographs one crater after the other. Their job was also to document possible landing sites on the southern plains of Mare Tranquillitatis. "Oh, my God! Look at that picture over there! Here's the Earth coming up. Wow, isn't that pretty!" said Anders. He first took black and white pictures, then asked for a roll of color — "quick!" Lovell managed to get a magazine of color film for Anders who then shot two images of the continuing earthrise. The whole crew was awestruck by the contrast between the ugly, gray lunar horizon and the view of the Earth hovering beautiful, lonely and fragile against the blackness of space. They recognized their home from 240,000 miles away. Such a sight inspires contrasting feelings. On the one hand, the insignificance of this small planet surrounded by so much nothingness, the lifeless matter of space, might make one ask, as one of the astronauts did, could Earth really be the center of the universe? On the other hand, seeing the Earth in contrast to space, is a reminder of how unique we are, and that we really should try and take care of this place that sustains our lives. The Earth itself is a spaceship where the whole humankind is together. That's what Borman, Lovell and Anders felt, and that's the message they wanted to spread when they returned and the 'Earthrise' picture took on an iconic significance and became one of the most important pictures of the 20th century. It still is. 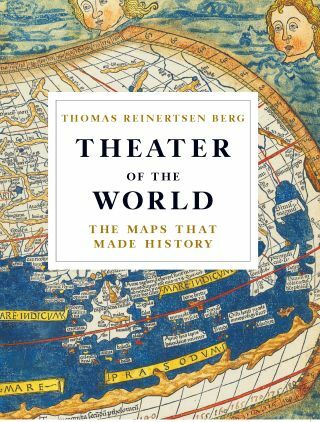 Ortelius called his book a theater because the Greek word theatron means "a place for seeing." And since Apollo 8's journey, only 21 other astronauts have seen what Borman, Lovell and Anders beheld up close, meaning that leafing through maps, globes and the pages of an atlas is the best way to hitch a ride with Apollo's chariot for the most of us. You can buy "Theatre of the World," written by Berg and translated by Alison McCullough, on Amazon.com. Follow us on Twitter @Spacedotcom and on Facebook. Original article on Space.com.